Celebrate Open Access Week with Linfield Libraries, featuring collections from the DigitalCommons@Linfield, Linfield's own open access digital repository. What is open access? "Open-access (OA) literature is digital, online, free of charge, and free of most copyright and licensing restrictions." Why is open access important? The advancement of scholarship depends on the communication of ideas. 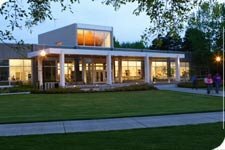 DigitalCommons@Linfield collects, shares, and preserves scholarship and creative works of Linfield College.